How to belay properly is the most essential skill in climbing, because catching a fall well hinges entirely on the belayer. It is the basis for a relationship of absolute trust between climber and belayer, because the belayer, literally, holds the climber’s life in their hands. While belaying may seem straightforward, there are a lot of ways a belayer can make a climber feel safe and secure – and not just by catching falls. A good belayer makes the climber know that they are being well looked after, giving them the confidence to concentrate on nothing but the climb. 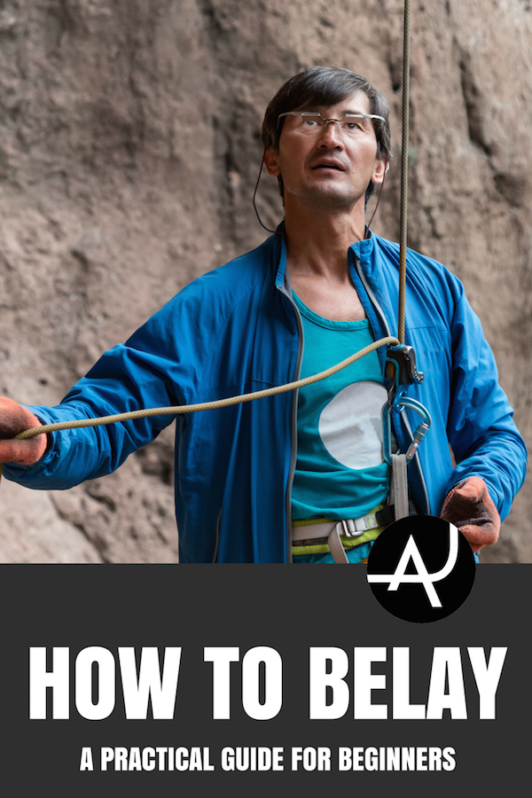 This post is all about how to belay well, responsibly, and safely. (Note that this post does not cover multi-pitch belaying). For most roped climbing (excepting rope soloing), there is a climber and a belayer, tied into harnesses and connected by a climbing rope. 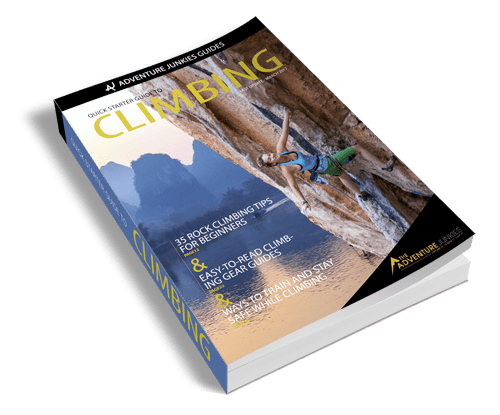 As the climber ascends, the belayer feeds out or takes in rope, depending on the climber’s position, and is always ready to catch a fall at any moment. The belayer uses a belay device to catch a fall, and to lower a climber from the top of the route. In the old days, people belayed off shoulders, hips, and around waists. 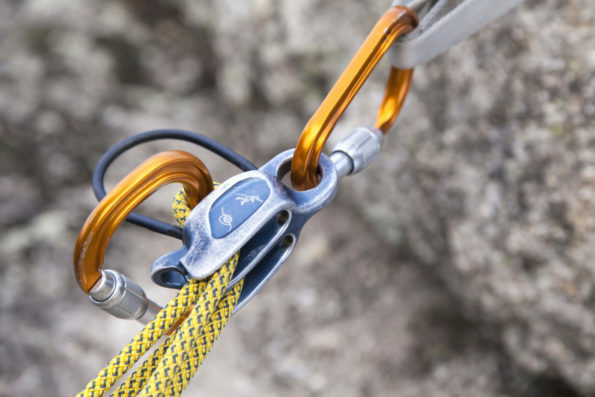 Modern technology has given us many belay devices, but the ATC and the grigri are the most commonly used. Both devices are clipped to the belay loop of the belayer’s harness with a locking carabiner, and are based on the same principles, increasing the friction on the rope to make catching a fall much easier. After feeding the rope properly through the device (refer to instruction manual), the belayer uses one hand, called the guide hand, to pull rope through the device when the climber needs more slack. The other hand, called the brake hand, takes in rope slack if the climber needs less rope. While you should always refer to the instruction manual for how to use any device, the golden rule of belaying is to always have the brake hand on the rope below the belay device at all times, known as the brake position. The devices are designed to catch a fall simply by keeping hold of part of the rope below the belay device, allowing the device and your weight to do the rest. If you only have your hand on the rope above the belay device – or not on the rope at all – and the climber falls, then the rope may run freely through the device, which could lead to a fatal accident. An ATC is shaped so it pinches the rope in three places. With the brake hand in the proper position, a fall will pull the rope taut, making the ATC pinch it and preventing it from moving. To feed out rope, you simply pull more rope through the ATC with the guide hand, while still keeping your brake hand in the brake position. A grigri contains a camming device that, if sufficiently weighted, pivots and traps the rope. While useful, it should not be viewed as full-proof; many accidents have occurred with grigris, and the instruction manual should always be consulted. As with an ATC, a brake hand should always be on the rope, under the device, ready to catch a fall. There are two ways to feed out rope, which are covered below under the heading: lead-belaying with a grigri. Good technique means being able to feed out or take in slack quickly and smoothly, and keeping the right amount of slack in the rope at all times, without breaking the golden rule. Most belaying techniques involved sliding the brake hand on the rope as it is fed out or taken in, to ensure that it is always in the brake position and ready to catch a fall. In top-rope climbing, the rope runs through an anchor at the top of the route and then down to the climber. While belaying on top-rope, you should keep the rope a tiny bit loose at all times, preventing the climber from losing much height from falling, but not so tight as to help pull the climber higher. As the climber moves higher, you take in any extra slack, and grab hold of the rope in the brake position if the climber falls. A top-rope belayer rarely, if ever, needs to feed out rope slack until lowering the climber. Lowering the climber from the top of a route also must follow the golden rule. Generally, you will keep at least one hand on the rope in the brake position, and then slowly let the rope run through the device to lower the climber, always in control, and always ready to grab the rope and stop the climber’s descent, if necessary. In lead climbing, the lead climber clips protection (a bolt or a piece of trad gear) as they move up. The leader climbs unprotected until the first piece of protection is clipped. In lead-belaying, you should give the climber a spot until the first protection is clipped. This entails standing below the climber with upraised arms, ready to catch them or soften the landing in case of a fall, exactly as with bouldering. After the first protection has been clipped, you should maintain a little bit of slack in the rope at all times. It should droop slightly as it comes out of the belay device, like a banana arc, before running up towards the climber. 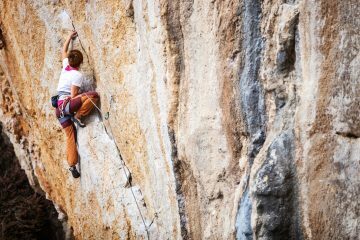 If the rope is too tight, the lead climber could be pulled off the rock face while trying to move higher. If it is too loose, the lead climber could fall much further than necessary. You may need to quickly feed out slack if the lead climber grabs the rope and lifts it higher to clip into protection. As your guide hand pulls out more rope, you allow the rope to slide through the brake hand, while always being ready to grab the rope in brake position, if necessary. You should watch the climber and anticipate when they are about to clip, and start to feed out more rope just moments before the climber goes to grab the rope to clip. After the climber has clipped the protection, the rope may become more slack as the climber moves higher. You should take in any excessive rope slack that results from the climber moving up, and then feed out the rope again as the climber moves past the protection – always maintaining the banana arc. One way to lead-belay with a grigri is exactly the same as it is with an ATC – with a guide hand to feed rope slack and a brake hand that is always in the brake position. But if you feed rope slack too quickly, the camming device in the grigri can engage and lock the rope. To avoid this, there is a second way to lead-belay with a grigri. While still holding the rope in the brake position, you press the thumb of your brake hand to the base of the grigri lever. This will prevent the camming action of the grigri, and allow the rope to run through the device without locking up. It is extremely important to keep the brake hand in the brake position, because if the climber falls with the grigri in this position, then the camming device in the grigri will not engage unless the brake hand grabs the rope and the thumb stops pressing the base of the lever. Lowering a climber from the top with a grigri is similar to using an ATC, but you have to fully open the grigri lever, while keeping the brake hand in brake position. The lever can help with the lowering, but the brake hand primarily controls the speed of the descent as the rope feeds through the grigri. If in any doubt, the belayer can release the lever and the camming device will engage, pinch the rope, and stop the descent. When catching a fall, the weight and force can sometimes lift you several feet off the ground. Be aware that a fall can pull you, sometimes violently, up and towards the rock face. For this reason, it is a good idea to be wary of things you might hit if pulled up (don’t belay in front of a spiky tree, for example), wear shoes to protect your feet, and be ready to lift your legs and land with soft knees and ankles. It is often better to belay directly under the first piece of protection. Belaying far from the base of the climb is an invitation to be thrown forcefully into the rock wall while catching a fall. 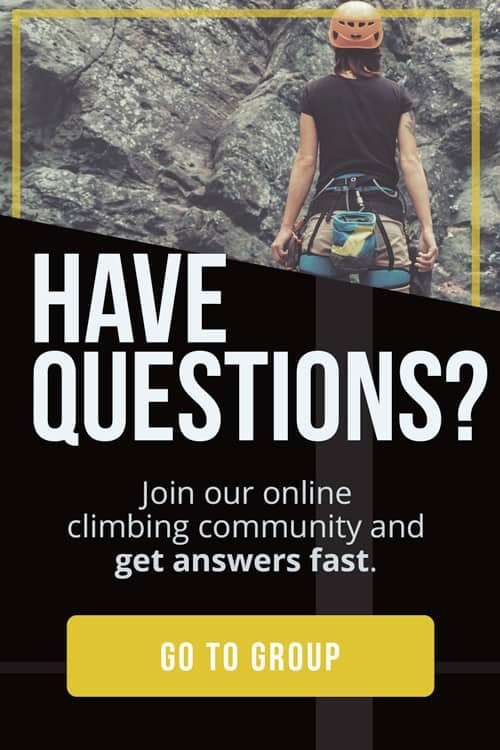 It pays to not have a huge weight difference; if your climber is much heavier than you, then a fall might lift you very high, sometimes into the first piece of protection. If you are much heavier than your climber, then you might give them a potentially injurious hard catch. These occur when the rope stretch is minimal, increasing the force on the climber and possibly slamming the climber into the rock-face. 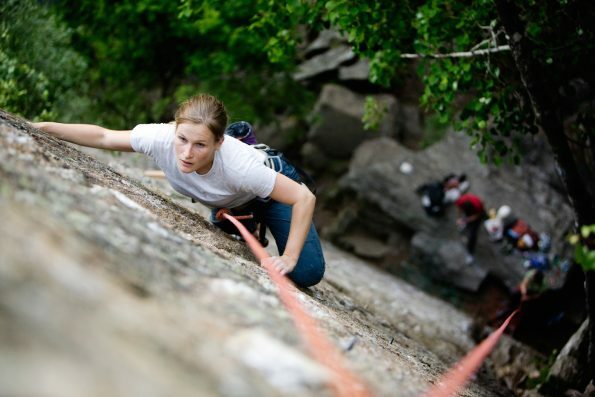 A number of injuries are attributed to hard catches, as it can be very hard on ankles, knees, or whatever part of the climber’s body hits the rock. A hard catch can happen a number of ways, including if the rope is really tight, the belayer is much heavier than the climber, or if the belayer weights the brake end of the rope (by, for example, sitting down) just as the climber falls. 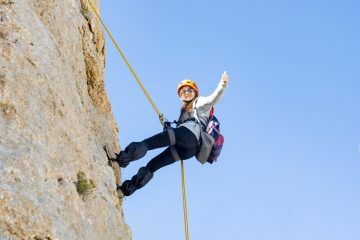 Sometimes a hard catch is warranted – if the climber is directly above a ledge, or in danger of a potential ground fall, then a hard catch might prevent the climber from hitting the ledge/ground. But most of the time, a soft catch is a much safer and more pleasant way to fall. A soft catch maximizes the stretch of the rope in a fall, meaning that the climber will usually fall a greater distance, but in a much gentler manner. It is counterintuitive, as falling further will often evoke a sense of greater danger – but soft catches are generally safer. A soft catch means the climber is much less likely to be slammed into the rock face, instead falling more vertically, and then slowly coming to a stop. Giving a soft catch as a belayer is a skill that takes practice. You need to give a bit more rope slack just as the climber’s weight comes onto the rope, while keeping your brake hand locked on the rope. 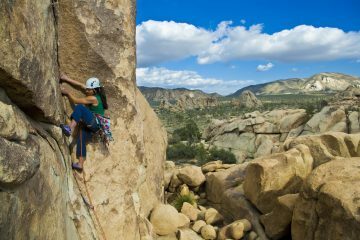 The easiest way to do this is to belay in a bent-knee position and to straighten your legs just as the rope comes taut. You can also hop or jump, to increase the rope stretch. The catch will pull you up and into the rock-face, so it pays to stretch out your feet and land softly. Before leaving the ground, double check that the climber’s rope is knotted properly into the harness, and that the rope is properly fed through the belay device. Check both harnesses – climber’s and belayer’s – are properly double-backed through the appropriate buckle. Ensure the leader has enough protection for the climb (12 bolts means at least 14 quickdraws), and that the rope is long enough to lower the climber from the top. Also, make sure that both the climber and belayer know what the descent plan is; accidents have occurred when, for example, the climber thought they were going to be lowered, while the belayer thought the climber was going to rappel down, and took them off belay. The best thing you can do as a belayer is to be attentive. Belayers have dropped climbers or not noticed potentially dangerous situations after being distracted. A good belayer is constantly aware of where the climber is, of any potentially dangerous hazards (such as a ledge that the climber could hit), and is always watching to see if the climber is clipping protection and might need rope slack in a hurry, or is about to fall and might need a hard or a soft catch. Sometimes a lead climber will climb to the side and the rope might come to rest behind the climber’s ankle. Falling like this will often see the rope trip the lead climber, flipping them upside-down (good image of how this happens halfway down the page). If the belayer sees this happen, they should warn the climber. A simple call of “watch the rope” suffices. Meaning to take in slack so the climber can rest on the rope. The best way to do this is quickly pull in any rope slack, hold the rope with your brake hand, and then lean back or sit down. Meaning to feed more rope slack to the climber. This call is common if the rope is too tight and the climber is trying to either move higher or pull the rope up to clip protection. The climber calls this as they are about to pull up the rope to clip protection, as a warning to the belayer to give more rope slack. The climber has clipped the protection, so any extra slack in the rope should be pulled in. The climber has reached the top and is ready to be lowered to the ground. Often follows a call of “TAKE” when the climber reaches the top. Short-roping is what happens when a climber goes to pull up the rope to clip protection but doesn’t have enough rope slack to reach. It can be terrifying as a climber on the sharp end, red-lining to the maximum and fearing the worst, to pull up the rope and find that there is not enough slack. If you are paying attention to the climber and are proficient at paying out slack quickly, you should be able to avoid short-roping. 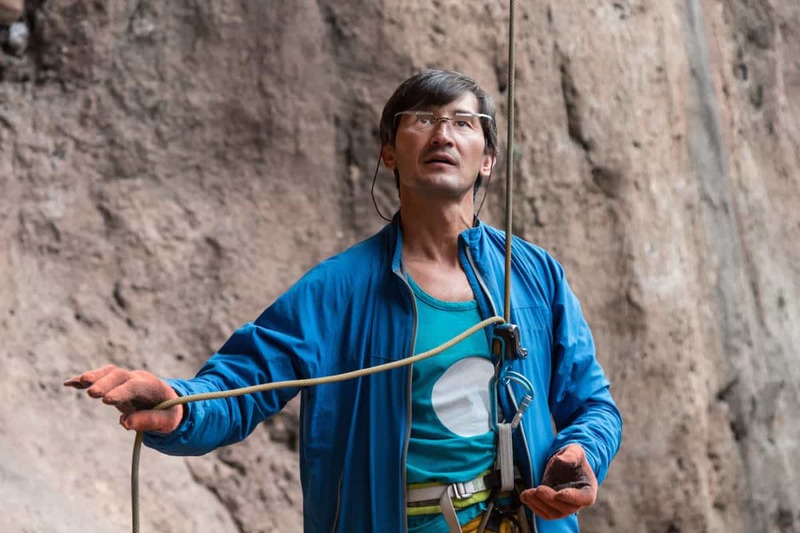 A knot in the rope will not pass through any belay device, and dealing with it while the climber is already on a route is inconvenient, if not downright dangerous. It always pays to flake the rope before climbing, which basically means to lay it down on the ground, passing every inch through your hands, to ensure that it has no knots in it. Rope management also means not only keeping the right amount of slack in the rope at all times (very little for top-roping, and a banana arc for lead climbing), but also checking the rest of the rope from time to time to make sure it doesn’t get snagged on a tree root or a rock, which could disrupt your belaying and, by extension, the climber. Belaying can be hard on your hands, particularly when lowering a climber. There are a lot of different belaying gloves to make this easier. Many gyms offer courses, where you can learn to top-rope belay and lead-belay under the competent supervision of gym staff in a safe environment.